Shenzhen KTC Technology Group (hereinafter referred to as “KTC”), founded in 1995 and headquartered in Shenzhen, specializes in the manufacturing of flat panel display terminal products. It is one of the earliest manufacturers of LCD monitors, LCD TVs, commercial LCD terminals and medical LCD terminals in China. Currently, the Group has more than 6,000 employees, and intelligent manufacturing industry parks in Shenzhen and Huizhou, with a gross floor area of 400,000㎡. The Group mainly consists of Shenzhen KTC Technology Co., Ltd., Shenzhen KTC Commercial Display Technology Co., Ltd., Shenzhen KTC Intelligent Technology Co., Ltd., Shenzhen KTC Medical Solutions Co., Ltd., Huizhou KTC Technology Co., Ltd., Hong Kong KTC Technology Co., Ltd., etc. Always adhering to the business concept of “Implement Integrity Management, and Focus on Quality and Service”, KTC is committed to providing high-quality products and serving customers with the highest standard. It strengthens the quality system and environmental protection, and has established first-class management systems. KTC has been certified under the SGS ISO9001:2015 quality management system, the SGS ISO14001:2015 environmental management system, the SGS ANSI/ESD S20.20-2014 electrostatic discharge standard, the Electronic Industry Code of Conduct (EICC), the integration of informatization and industrialization management systems, etc. Products of KTC Group have passed numerous domestic and overseas certifications such as CCC, TCO03, CE, CB, FCC, UL, SASO, TUV, ROHS, Energy Star, and CECP. Also, KTC highly values the internal management and has established sound PDM, ERP, CRM, SCM and MES management systems. As a national hi-tech enterprise and an accredited technical R&D center in Shenzhen, KTC has formed a sound R&D system - KTC Technology Center, through over two decades of continuous investment and development. This center undertakes the mission for core and front-end technology research and development, new product development and industry upgrade. 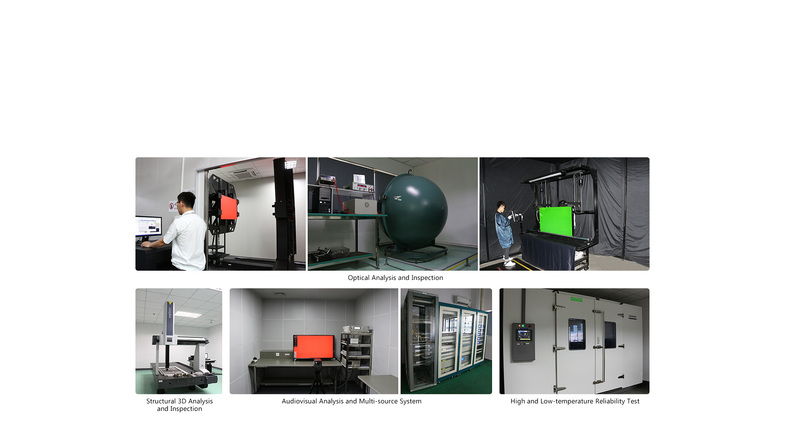 Its R&D architecture consists of Structural, Electrical, Software, Optical, Technology and Product Departments and Testing & Experimental Center, which has hundreds of professional R&D engineers and elites from the flat panel display terminal industry. Each R&D department under the Technology Center is assigned with their respective tasks, implements collaborative development with the advanced collaborative development management system (PDM system), and tracks the development trend of industrial technology. Their R&D level and quality inspection capability rank among the best in the industry. Caring for the growth and development of every employee, KTC has made outstanding achievements in capital input to skilled talent training, and in establishment of skilled technician incentive management mechanism, etc. ; it continuously enhances the construction of talent team and makes great efforts to attract and train more skilled personnel, high-caliber personnel and technical experts. Through KTC University, new employee mentorship program, new backbones program, internal trainers, interest group, external training and other training programs, KTC helps employees to realize career planning and self-improvement, encourages professional dedication, skill advancement, and innovation and creativity. KTC is honored the “Craftsman Training Model Company in Shenzhen” and “Outstanding Enterprise in Social Responsibility Fulfillment”. Since KTC entered the field of PC monitors in early 1990s, it has been making relentless efforts in pursuit of high quality through efficient enterprise management, exquisite craftsmanship and personalized service, showing great competitiveness in the smart flat panel display field. The Company has been successively honored as “Top 100 Electronic Information Enterprises in China”, “2008 FORBES CHINA 200 UP-AND-COMERS”, “China’s Top 10 Color TV Export Company”, “Top 500 Private Manufacturing Enterprises in China”, “Top 100 Manufacturing Enterprises in Guangdong”, “Top 100 Industrial Enterprises in Shenzhen”, “Top 100 Independent Innovation Enterprises in Shenzhen”, “Best ODM Suppliers of Commercial LCD Equipment”, etc., which has brought good social effect and influence. KTC’s smart products are sold to countries and regions in South America, North America, Europe, Africa, Australia, and Asia. The Company has established a stable sales network and maintained good cooperative relationships with domestic and international renowned enterprises. Over these years, KTC has forged a complete and sound system of domestic and overseas after-sales services. As the flat panel display enters a new digital, intelligent and network-based era, KTC is expanding to smart TVs, medical displays, commercial displays and other fields through continuous innovation, core technology breakthroughs, and service segmentation and customization. It has become one of the Top 100 Electronic Information Enterprises in China. With an independent R&D system and technological advantages, the Company has been accredited as a national hi-tech enterprise and a municipal R&D center in Shenzhen. It is also active in exploring new business models and creating new demands. Based on differentiated and customized products and services, it endeavors to open up new prospects for sales growth and to build and constantly improve the intelligent manufacturing system and product family, thus to lay a foundation for steady corporate development. Looking into the future, KTC will, with a new image and adhering to the service concept of “Customers First and Creates Affection”, continuously enhance its capability in innovative development, and establish and improve its intelligent manufacturing system, thus to provide customers with high-quality smart display products and solutions. With the concept of “Technology Improves Our Life”, the Company is marching toward a larger scale and a higher level, endeavoring to become a world-class professional manufacturer of smart flat panel display products.